For over six years I have been espousing the virtues of 3D, stereo voice conversations with articles and ITEXPO demonstrations mostly focusing on DiamondWare and the company's patented 3D technology which allows you to have a conference calls with others and place them on the left right, front or rear. Until you have heard a conference call in 3D stereo, you have not heard a conference call. In addition, the technology allows the addition of overtones like adding a metallic sound to a speaker or group of speakers on a conference call. This function could be useful if you are looking to find a way to discern what group a person belongs to -- the Los Angeles office for example. You may recall that on May 15th of this year, I suggested Nortel would even buy DiamondWare. Well today is that day as Nortel did just that... They purchased the company and further explained how they have a portion of their R&D budget devoted to making VC-like investments but of course with a potentially different exit strategy. Nortel believes the future of communications is likely going to be avatar-based and even if they are partially right -- let's say 5% of all calls, this could be a huge market. Nortel is further betting that the technology advantage they have as a result of this acquisition will help insulate them against others in the market who compete. That would be Avaya, Cisco and even to a lesser degree (at the moment) Microsoft. Many of my blog readers know Bill Kelly well from his years of work building partner programs in the industry for companies like Excel and Cantata (after the company merged with Brooktrout). Add to this a brief stint at Pulvermedia and Kelly becomes the perfect person to help improve the quality of ITEXPO conference content. With Bill's vast experience he is the perfect person in fact to be at the show. What will Bill be doing at ITEXPO? He will host two courses in the TMC University program, which is open to all conference attendees. Bill's classes include "FMC/Mobility" on Tuesday September 16th and "IP Network Security" on Wednesday September 17th. "From an educational perspective, TMC University offers a unique opportunity for attendees to obtain third-party certification that recognizes their competence in selecting, installing and managing important communications solutions. As a part of ITEXPO, TMC University also provides a tremendous networking opportunity, and I'm looking forward to the entire event, catching up with colleagues and learning more about the latest solutions on the expo floor." And of course, much of the networking at the show might actually involve Bill as he is so connected . If you were wondering whether your favorite Starbucks will be one of the 600 stores the company is about to close, the entire list (PDF) of stores to be closed has been made available. California will see just under 90 stores shut down while Florida and Texas just under 60. TMC's home state of Connecticut will lose five stores -- the closest is about ten miles away from TMC and a store I have never visited. Digium will lose one store in its home city of Huntsville, Al (Madison Square Mall), Manhattan will lose six and Southhampton is the only location in the prestigious Hamtons to be whacked. Expect stores to close early next year. There have been petitions circulaing to save specific locations and government officials are trying to persuade the company not to shut certain stores. What I find amazing about these incidents is that many used to complian that Starbucks killed off the local coffee shop and made coffeee a chain-like experience. I almost fell over when I received an email from the Microsoft PR team titled "Microsoft Exchange and iPhone." To me this email is as unexpected as an email from Microsoft requesting I rely on open source software . But of course I kid ever so slightly because the email describes the ways the iPhone can now play nice with Microsoft Exchange. Myerson: Our goal with Exchange ActiveSync was to create an open solution that lets mobile device makers pick and choose the kinds of features they want to activate. In other words, it's really up to Apple what features they want to support in iPhone. 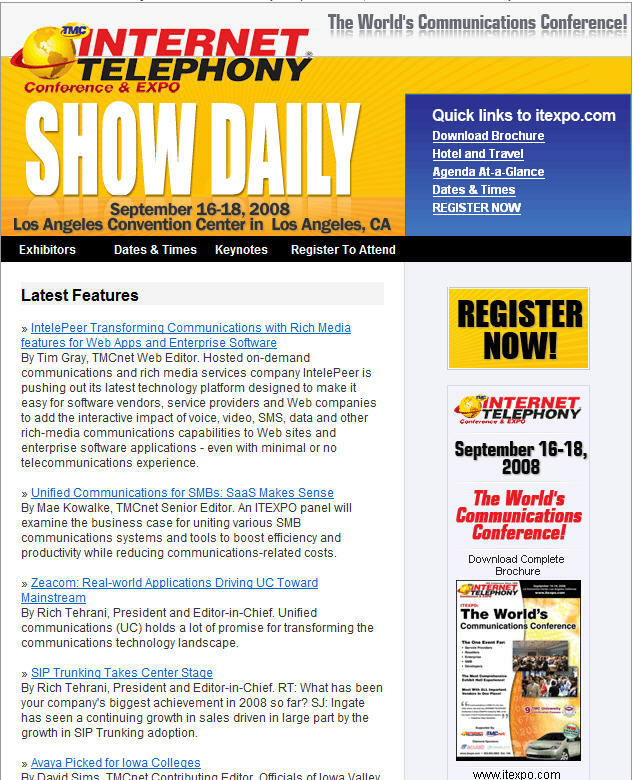 I promised yesterday that we would be devoting great focus to ITEXPO this week and to kick things off I want to ensure you are aware of the TMC University courses which will be offered at the show September 16-18, 2008 in Los Angeles. We have been running TMCU sessions for many years and we have had hundreds of graduates who walk away from the event better educated on various topics and if they pass the test at the end of the session(s), they also have the bragging rights of a diploma which can boost their resume value and get them valuable consulting/reseller assignments. The program has focused on open source, SIP and IP-PBX topics in years past and for the first time we have greatly expanded the number of courses provided to ensure we can help you get certified in multiple courses at once. These are the important areas of the market where the seems to be great interest in certification as well as hiring. Here is the complete list of topics and a page with the details. Come to the show and try your luck skill at becoming a happy graduate, along with the hundreds of your peers. Be part of an elite group -- only at ITEXPO. Do we realize the importance of what we do? I have been thinking about this question a great deal lately. I see the amazing technology being developed by the entire industry and I just can't help but wonder - do we realize how important we are to the world economy. I am far from an economist but I know that when productivity improves so does the standard of living.